There are no direct buses to Sharm-el-Sheikh from Mount Sinai- it’s necessary to go through Dahab. The one bus for Dahab leaves at 1pm. We took a taxi down from the Monastery (which doesn’t accept credit cards by the way, but does accept US$), and instead of taking 2 buses to Sharm, we arrived at a price of $40 US for him to take us directly. It’s about a 3.5 hour drive. 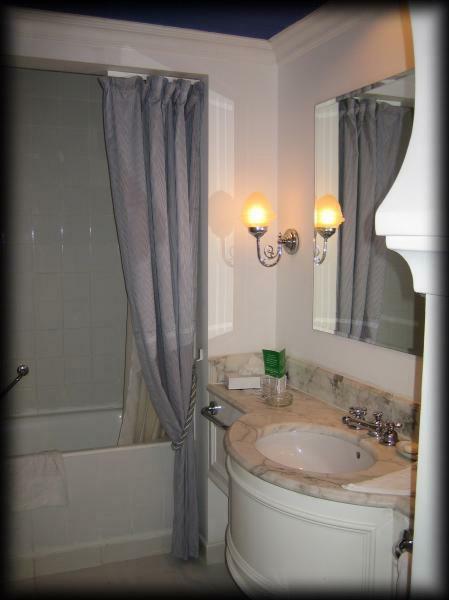 Our bathroom at the Sheraton Sharm-el-Sheikh. 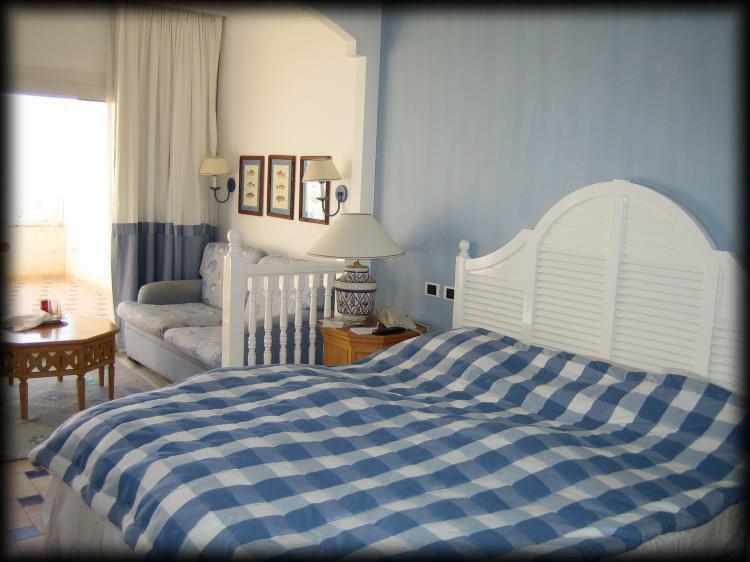 Our room at the Sheraton Sharm-el-Sheikh. He dropped us off in downtown Sharm-el-Sheikh, where we picked up the most expensive groceries we bought in Egypt, got more cash (dispensed in 100 LE notes, the first time we’d seen them. 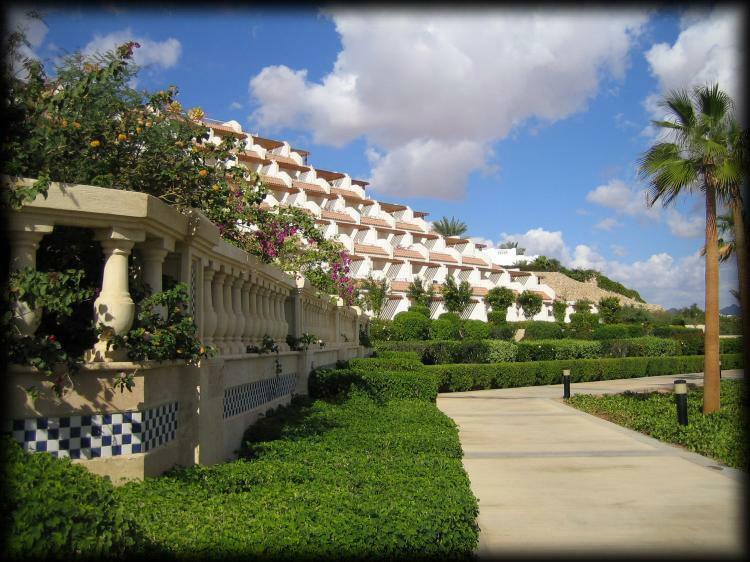 Tourists in Sharm have MONEY), and headed for the Sheraton. We’d managed to arrange a price of $50 US a night on the net (which turned into $80 unfortunately, Ian had missed that the $50 was a ‘one person’ price for a ‘double’ room) . The taxi driver (actually a ‘mini-bus’ driver) told us it would be 10 LE to get to the hotel, direct. Then he started picking up other people on the way. A huge shouting fight ensued, and finally we won (screaming at people always seemed to work in Egypt – we heard plenty of screaming matches between Egyptians), and he continued directly with no other passengers. From our room, an overview of the pool. 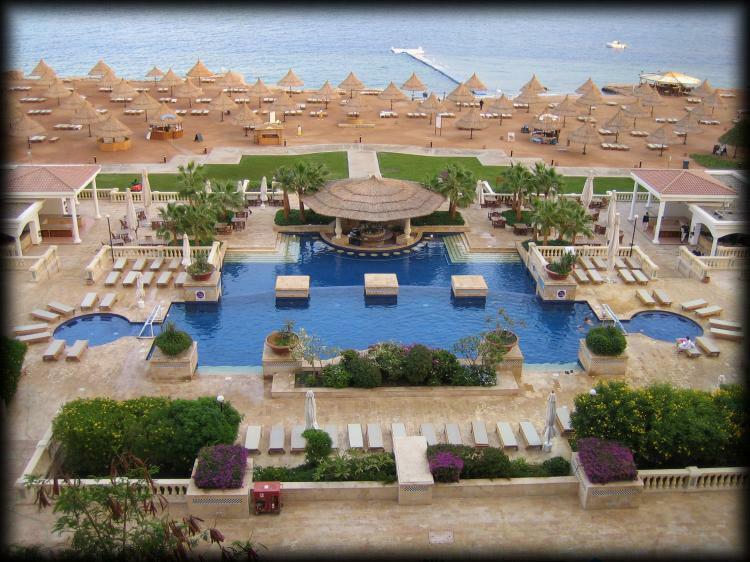 The Sheraton Sharm-el-Sheikh is a beautiful hotel. We were staying in the hotel, not the resort, so we can’t comment on that. The building, the grounds, everything is beautiful. There is a constant parade of cleaning staff. The pool is beautiful, complete with a swim-up bar. The beach isn’t really soft sand, but there are lots of umbrellas to go around. It’s not really a swimming beach, as there’s lots of coral. The snorkeling was impressive, but to be honest, we've seen better elsewhere, and it was much warmer. We're a little spoiled by the Carribean. 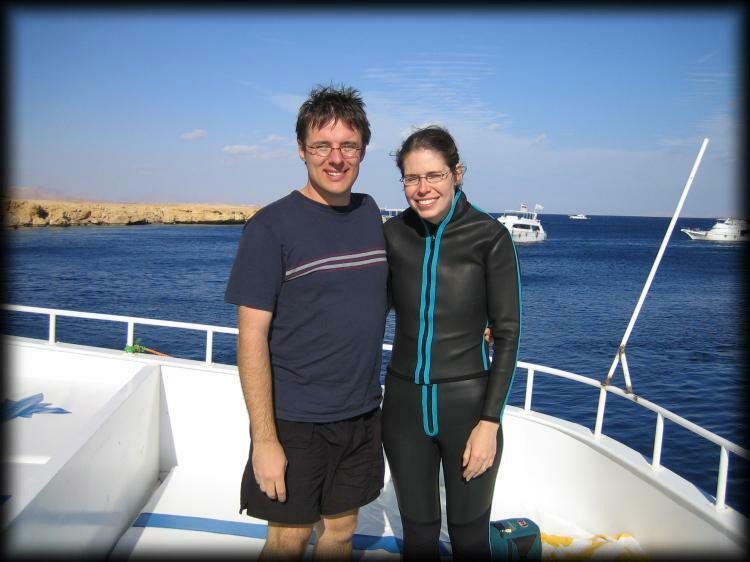 The following day, we headed out on a somewhat badly organized snorkeling trip to Ras Muhammad National Park. Although the Sheraton gave the impression it was their own trip, in fact they were selling it for the Hilton, who was selling it for "Sun and Fun". After we were passed between the different parties, we were able to rent snorkels, masks, fins, and a wetsuit for Wendy. The boat was clean, big, and modern. Lunch was delicious. The instructors/snorkel leaders were organised, and we felt very safe in the water. Ironically, one of the other Sheraton guests told us that the coral right off the Sheraton’s beach was just as nice as what we saw on the boat. But hey – how could we have known? By the time we got back to the Sheraton, the sun was setting. No matter where we looked, there was staff scurrying around cleaning, polishing, sweeping...and it showed! Dinner that night was room service. :) Because of the holiday, the only vegetarian friendly restaurant was serving a special "fixed price" $110 US menu. Uh, no thanks. Room service was very good though, and cost $25 US for both of us to eat! The following day was our only day to enjoy the hotel’s amenities. Unfortunately, it clouded over around noon and didn’t clear up till we had to leave.